Division IV has been another strong division for the North Coast Section when it comes to state meet success. Individually, Morgin Coonfield McKinleyville finished in the top 3 the past three seasons ('13 3rd, '14 2nd and '15 2nd). Jeremy Leary Sir Francis Drake finished in 5th place last season. Team wise, the Piedmont girls finished in the top 5 during the same time period ('13 4th, '14 5th and '15 5th). The Arcata girls finished in 2nd place in 2012 while the San Rafael boys landed on the top spot in 2010. This coming season, 3 boys teams and 4 girls teams will automatically qualify to the state meet from this division. Several teams who have been Division III teams in the past will now compete in this division including state meet contenders Bishop O'Dowd and Miramonte. Without further ado, here are my pre-season rankings for teams and individuals that will potentially contend for state meet berths on slightly changed Hayward HS cross country course. For the girls, the team favorite will be the already mentioned Bishop O'Dowd. The school has competed in Division III for over a decade now but the last time they competed in this division in 2004, the result was a section title. BOD was led by individual section champion Ariel Wright and then unknown freshman, Alexi Pappas. She will be competing in the upcoming Olympics for Greece and you can read about her in the just posted article in Rolling Stone magazine at this LINK. BOD returns their entire team from last year's Division III 2nd place team including individual champion, Grace Taylor (17:30.1 at Hayward). They will be challenged by the defending Division IV section champion, Piedmont. The Highlanders return 6 of their 7 participants from last year's section meet and will be led by sophomore, Erin Hong (5:31.30/11:57.36). Miramonte, another Division III competitor last year, finished in 5th place but will be looking for a state meet qualifying spot this year. Also in the mix will be '15 state meet qualifiers McKinleyville and Arcata. Both teams lost their #1 runner but will have the majority of their team members back. One thing for certain is that Morgin Coonfield will not win the individual title. Following a 4th place finish as a freshman in 2012, Coonfield ran with three straight individual titles. She will be taking her talents to Cal Poly San Luis Obispo which means that Division IV will have a new individual champion. It is however possible that a returning champion from last year could win this division. Grace Taylor of Bishop O'Dowd won the Division III race with a time of 17:30.1. She will compete in this division but her status is up in there air as she did not compete in the spring Track and Field season. 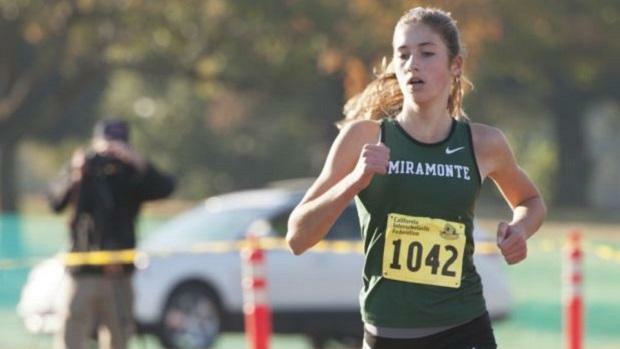 The favorite, regardless, will be Cassy Haskell (4:52.29/10:51.37) of Miramonte who finished finished just behind Taylor in the NCS Division III race and had the fastest time at the state meet by a non senior. Piner's Cynthia Rosales (2:22.50/5:27.60), Bishop O'Dowd's Jourdan Aman (2:24.17/5:16.89), Alhambra's Marissa D'Atri (2:17.61/5:11.21) and Piedmont's Erin Hong will all race up front and will be in contention for an individual spot should their teams not automatically qualify to the state meet. 1) Bishop O'Dowd-Aiming for first section since 2004 in same division. 2) Piedmont-2-time defending team champion with lots of talent returning. 3) Miramonte-No team in this division can match up with the Mats at the front. 4) Justin-Siena-Made state last year however the challenge is greater this year. 5) McKinleyville-Lose all-world Morgin Coonfield but program will continue to thrive. 6) Arcata-Tigers have been perennial contenders in this division. The boys pre-season rankings will be posted next. Comments? Do you know of impact freshmen that will attend at any of the above schools? Feel free to chime in the comment section below. With the new divisional realignment in the NCS this division has drastically changed over last season, with perennial powers Bishop O’Dowd and Miramonte moving down into Division IV with Maria Carrillo and Redwood moving back in from DII, which should create a number of interesting matchups for this season. Campolindo still appears to be the team to beat this season, with the 3 time defending champions returning a solid portion of last year’s title team along with a great deal of talented upstarts from the frosh-soph level. Redwood and Maria Carrillo will both be in contention for the title as well as the two schools return a great deal of talent as well. The Cougars lose 4 varsity members to graduation but they return a very solid front end which will be tough to beat. Senior Jared Yabu had an electric fall last year, finishing in 2nd place at NCS and following that up with an 8th place finish at state. While illness and injury derailed the majority of his track season, he still is firmly one of the favorites for the individual section title. Fellow senior Ray Diaz had a remarkable spring in running 9:32 for 3200m and advancing to MOC in that event. If he continues his upward momentum he could also factor into the title discussion. 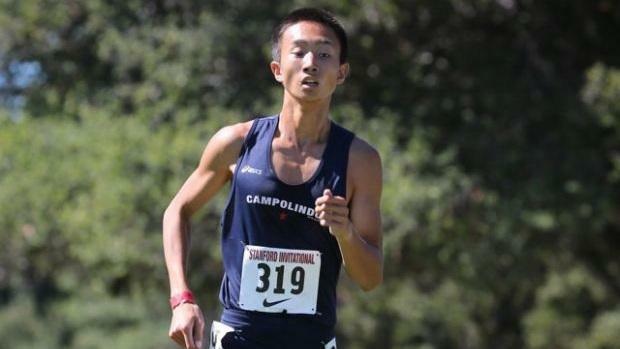 Veteran Richard Gong also excelled in track running 9:49 for 3200m which gives “Campo” the best front end in the section. After those 3 there is some uncertainty as to who will fill out the rest of the lineup but the Cougars have plenty of talent to fill those gaps. Teddy Buckley and Cameron Iniguez-Reyes had fantastic freshman campaigns in track, with the duo clocking 10:16 and 10:25 in the 3200m respectively. Thibault Gourlin, Ethan Sauerberg, and Tim Sams also had productive track seasons at the F/S level and should help fill out the back end. 2015 DFAL JV champ Kyle Flett has experience at the varsity level and should contribute as well. 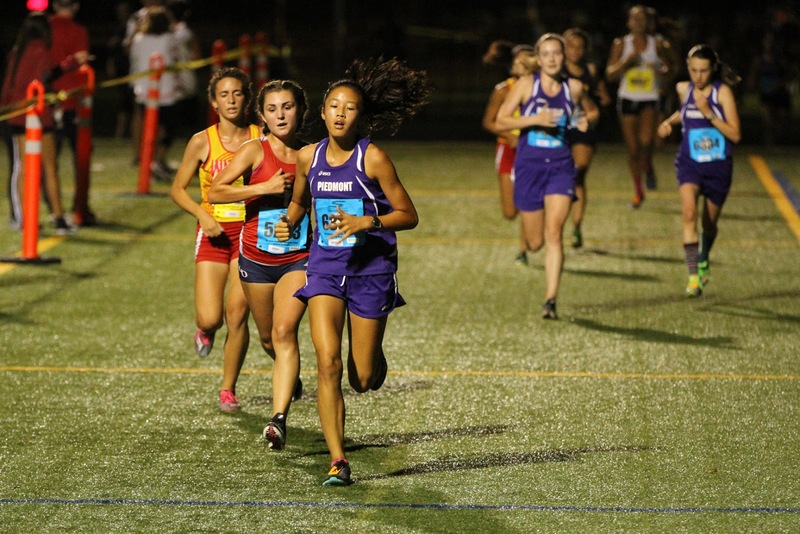 The biggest X factor for Campolindo this season is the addition of NCS MOC 800m champion Niki Moore, who will be doing cross country for the first time this fall. While middle distance performances do not always translate to a 3 mile/5k, Moore ran a solid 4:31 over 1600m during the spring. While they may be a bit short on experience coming into this season, Campolindo has the ability to capture another section title and are the favorites at this point in time. The Giants rolled to a 2nd place finish in DII last season and return an abundance of talent which will put them in contention for the section title this year in DIII. Liam Anderson had a remarkable freshman year, making the final in the 1600 at MOC and running 4:18. He was also stellar last fall and will no doubt be looking to make another massive jump this year. Andrew Thomas peaked masterfully down the stretch in track to qualify for the state meet in the 800, running 1:55. 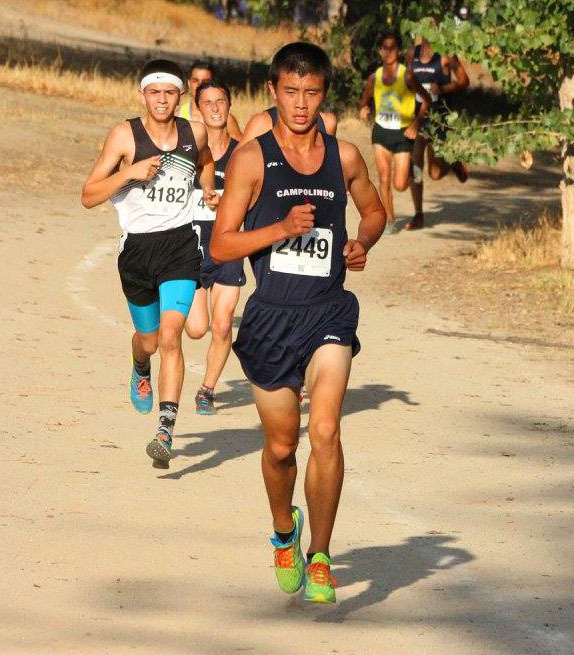 He was a scorer last XC season for Redwood and is primed to make another big jump this year. Junior Zach Martinez flashed great potential in running 4:31 for 1600m as did sophomore Austin Patel who ran 4:42 over the distance. Throw in James Conant (10:08 for 3200m) and Ollie Sagatsume (10:14 for 3200m) and you have the makings of an incredibly deep and solid team. The big challenge will be getting newcomers up to speed when it comes to running the longer cross country distance. If the Giants are able to do this they will be right in contention to pull out the victory come November. The Pumas captured the DII title last season and will look to contend for the section title once again this season. They are led by the dual threat of Ben Lawson (4:23/9:57) and Scott Kruetzfeldt (4:32/9:38) who are both coming off of great track campaigns and will provide a low scoring 1-2 punch. Zach Lindemann (10:08) and Jacob Wright (10:15) look to be next up in the order and should they continue their improvement curve will give Maria Carrillo with a fantastic starting point. After that there is a bit of a drop off to Taylor Ingram, who clocked a respectable 10:43 for 3200 and Cooper Moore who ran 4:48 for 1600. In order for the Pumas to close the gap on the top 2 teams they will need to address this issue with their back end and cultivate some more depth. As it stands now they have the potential to be in the mix for the title with their great front end, but depth is king in cross country and in order to truly close the gap they will need to be able to go 7 deep. For now things look good! 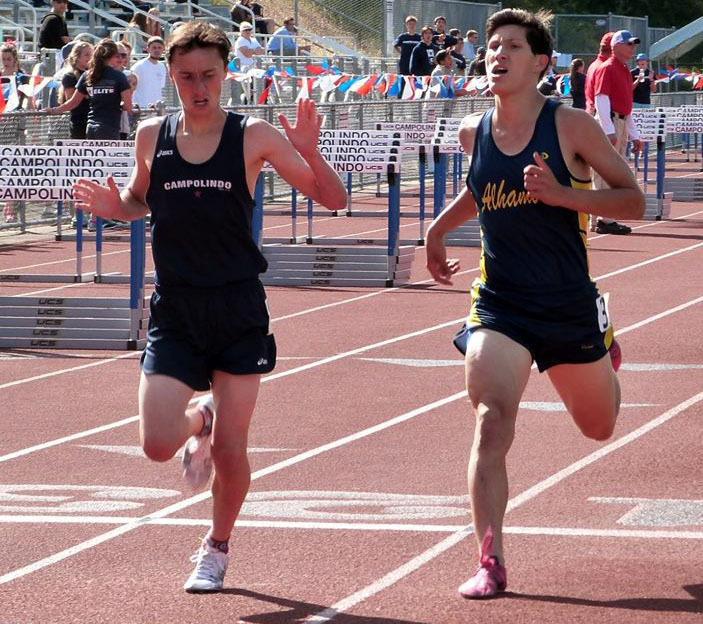 The Knights lose a ton from last season’s NCS runner ups but they return two mega talents in Preston Norris (4:25/9:50) and Parker Wilkerson (2:01/4:46) who are both coming off of impressive freshman track seasons. Both of them were regular varsity members last cross country season and should have no problem stepping up into big time roles on the team this year. Underclassmen Preston Rodriguez (4:49) and Jacob Renaghan (4:53) had productive spring seasons and will look to step up and become contributors in 2016. There is a big drop off after that but Las Lomas regularly has one of the largest teams in the section year in year out (with over 120 athletes on average) so finding the talent to plug in should not be much of a problem for them. With an even keeled approach to the season the Knights will be in prime position to return to the state meet. The Broncos find themselves in new territory this year, not only moving down from DII but also moving into the new Diablo Athletic League where they will get to compete against talented squads from Campolindo, Miramonte, Las Lomas, College Park, and Clayton Valley. This should prove a good measuring stick for Northgate as they try to put themselves in contention for a state berth. Omar Kabani, Wyatt Abranches, Connor Kugler, and Michael Wheeler all ran under 4:50 for 1600 this track season which gives the Broncos the needed depth to compete with Las Lomas for the final state meet berth in this division. Add in sophomore Joseph Momich who posted a solid 10:45 in the 3200 as a freshman and Northgate looks like they will be a solid contender this fall. If they can focus on racing and training as a pack, feeding off of each other and working together, the Broncos will be much improved this season. We will start a list here. Please list the top incoming freshmen for both Cross Country and Track and Field. If there are other athletes that you feel should be included in the above list, please list them in the comment section below along with their PRs. With the divisional changes taking place this coming season, Division V will look very similar since the top teams in this division are all under last year's cutoff of 500. Although, the top end of this division goes up to 600, the top teams will remain the usual suspects who compete for the state qualifying spots year after year. 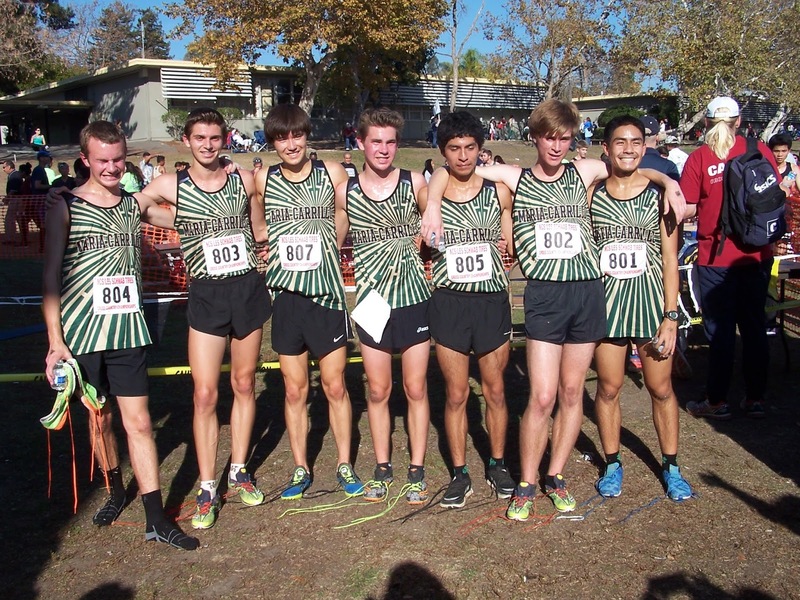 Looking back at the past few seasons on the boys side, Urban School boys edged out St. Joseph Notre Dame 64 to 65 to win their first NCS cross country section title in 2010. SJND then ran off 4 consecutive section titles as well as 4 state podium finishes which included 2 state titles in 2012 and 2013. 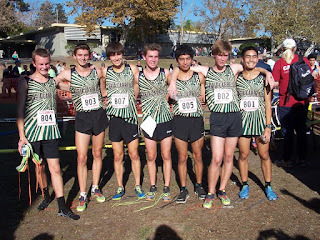 Marin Academy, perhaps in the shadows of SJND, had a nice run of their own during the past few seasons that included last year's section team title and two 2nd place finishes at the state meet in 2013 and 2015. 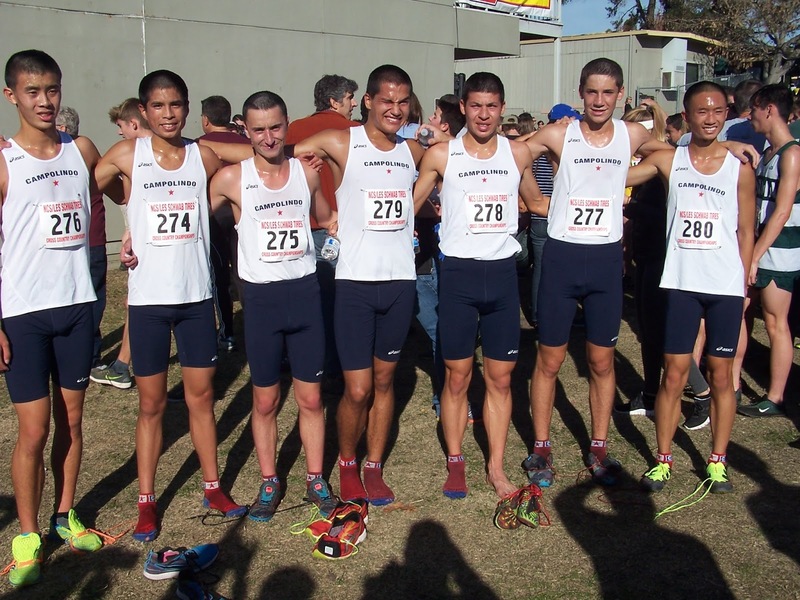 This coming season, the SJND boys will be the favorites once again to win the team title. 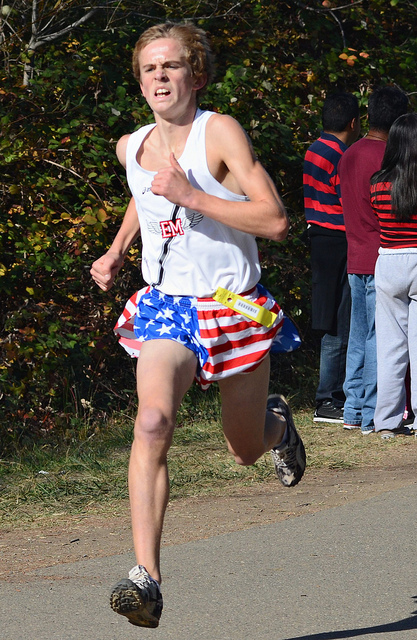 They return the best runner in this division, Cooper Teare (more on him later), as well as 6 of their 7 competitors from last year's section meet. The next best team appears to be Lick-Wilmerding. Sean Laidlaw (4:44.43/9:51.43) will be their #1 runner after competing in his first Track and Field season. The next group of teams all finished in the top 7 last season but will need to replace some talented seniors from the 2016 class. University, Athenian and Sonoma Academy will all be in the mix for a top 5 finish and each team will return their #1 runner. University finished in 5th place at last year's section meet but rebounded with an 8th place finish at state. 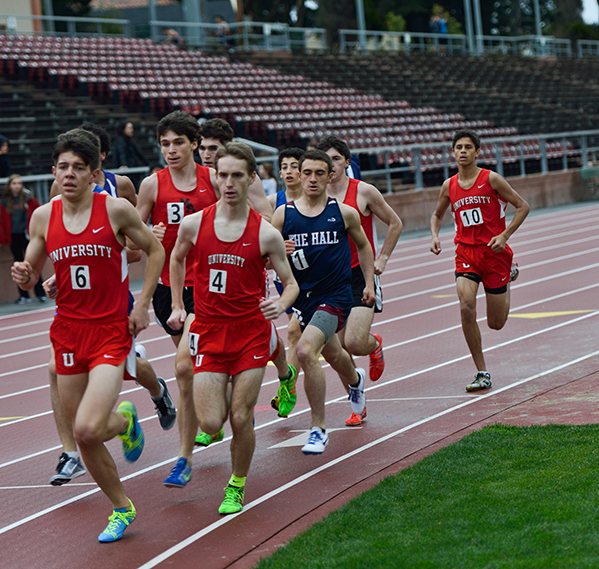 They will be strong up front with Spencer Small (1:57.06/4:26.16) and CJ Dowd (1:59.60/4:31.90). SA returns 6 out of 7 and coach Danny Aldridge has had a lot of success coaching at Maria Carrillo and Sonoma Academy. College Prep lost their #1 runner Alex Glavin but will still have a strong #1 in Ethan Ashby (9:35.36). 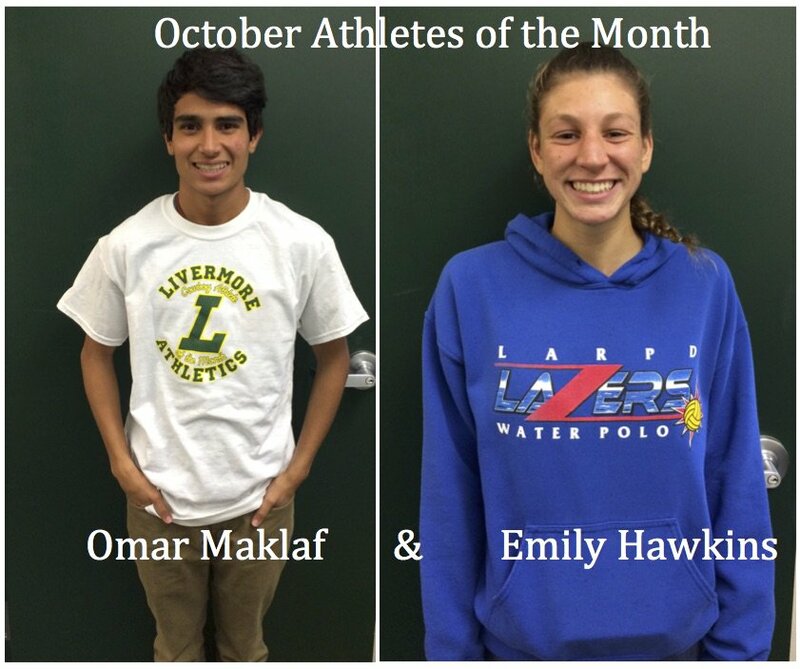 Marin Academy have lost some very talented runners over the past few seasons. They lose their top 3 runners from last year's team but based on their success the past few seasons should not be counted out. Individually, Cooper Teare will be the overwhelming favorite to repeat as section champion. 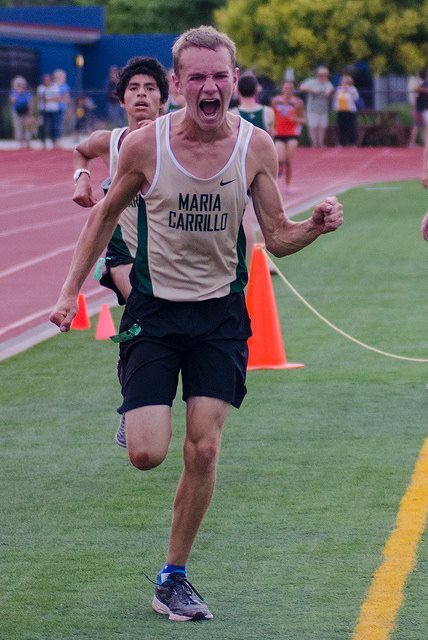 He ran 14:46.4, which is the 2nd fastest time on the Hayward HS course for a Division V athlete trailing only the 14:44 run by Trevor Reinhart (Marin Academy) in 2013. The course will be slightly different this year so Teare should establish the course record on the "new" course. Looking back at his junior season, Teare won the CA state meet in an epic finish over Jack Van Scoter of Flintridge Prep 15:07.313 to 15:07.316. 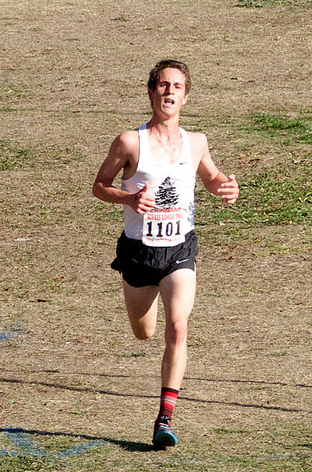 He also won the state 3200m title by an even closer margin over Cole Spencer of Great Oak 8:51.845 to 8:51.847. Brian Schulz El Molino finished in 2nd place at last year's Division IV race and will be a section and state contender in this division in 2016. Eli Horwitz (1:57.83/4:20.63) Stuart Hall and Dawson Reckers (2:04.98/4:24.02) Athenian finished in 4th and 5th place respectively. Other contenders include Sean Laidlaw L-W, Ethan Ashby CPS, CJ Dowd UHS and Kheva Mann SA. 1) St. Joseph ND-Will be motivated to win 5th section title in the past 6 seasons. 2) Lick-Wilmerding-Looking to win first male section title since winning Division III in 1989. 3) University-The most successful team in this division aiming to return back on top. 4) Sonoma Academy-Return 6 out of top 7 from last year's section meet. 5) College Prep-They will be in the mix with solid #1 and typical depth. 6) Athenian-Will need some freshman help to contend once again for a Fresno trip. 7) Marin Academy-On the outside looking in at this point but may surprise in November. The girls pre-season rankings will be posted next. Comments? Do you know of impact freshmen that will attend at any of the above schools? Feel free to chime in the section below. Feel free to comment on any of the divisions in the comment section below. 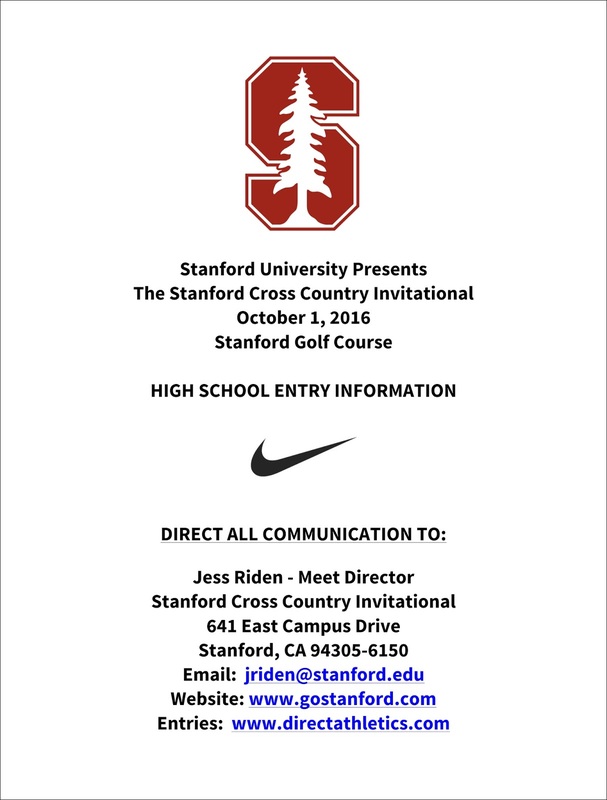 If you spot any errors, please email Jesuit HS coach Walt Lange at wclange@gmail.com. You can also view the rest of the other already completed maps at this LINK. College of San Mateo Track & Field/Cross Country is currently seeking qualified candidates for the position of Assistant Track & Field/Cross Country Coach for the jumping events including high jump, triple jump, and long jump. This is a part-time position assisting the Head Track & Field and Cross Country Coach with all duties involving administering a high level track and field program, including assisting with practice, recruiting, hosting events, and more. Past collegiate competition or coaching experience preferred. Drivers license and bachelor’s degree required. Please submit a cover letter, three references, and resume to Head Coach Matt Layten at laytenm@smccd.edu. San Jose State Cross Country will be hosting a brand new coaching clinic catering to the sport of cross country on August 20, 2016 at San Jose State University. The clinic will be featuring speakers who have coached high-level athletes and teams at the collegiate and high school levels. Speakers include Brad Wick of San Jose State University, Matt Layten of College of San Mateo, and Patrick McCrystle of Bellarmine College Preparatory. 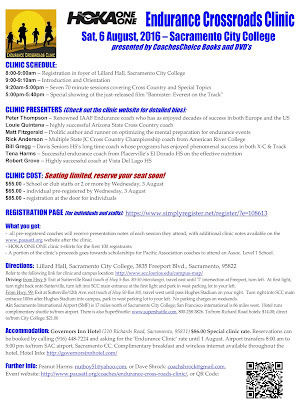 The clinic is open to all who are interested and will cover various aspects of coaching cross country, including training design, supplemental training components, program building, and more. 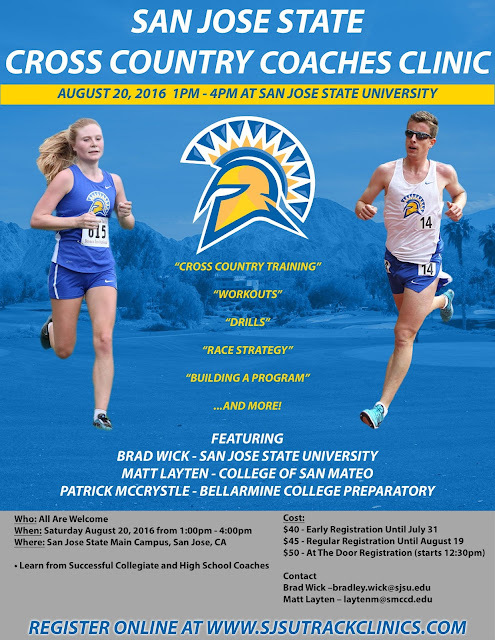 Signups will occur online at sjsutrackclinics.comand there will be signups at the door on the day of the clinic from 12:30pm to 1:00pm. 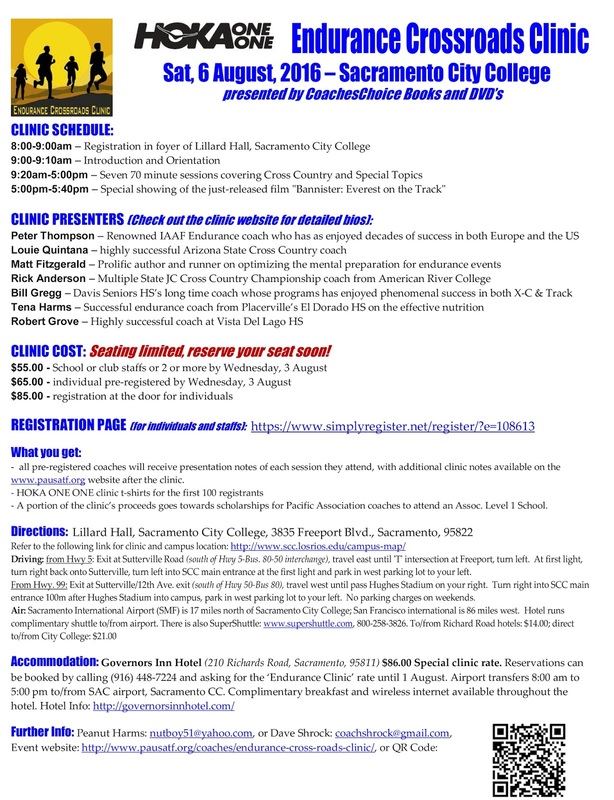 More information can be found at our website: sjsutrackclinics.com . Fiona O’Keefe National distance star from Davis High School – her next stop is Stanford! You can now find that information at this LINK. You can also access the information for this clinic at this LINK. I am going to start posting some of my favorite interviews from the past that may be new to some of our younger visitors. Here is the first with former Jesuit HS runner, Paul Thomas. Today we chat with one of the all-time greats from Jesuit High School, Paul Thomas (on the right courtesy of Bill Leung Jr). He graduated from Jesuit in 1987 so unfortunately was never able to compete at the California state XC meet individually and with his talented teammates (1st year of the CA state meet was in the fall of '87). 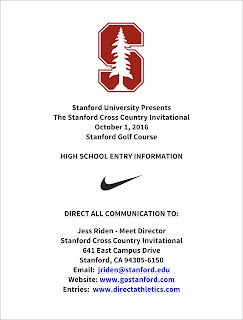 You can check out Jesuit HS's incredible depth, especially in their distance events at this link. He still had plenty of success in high school such as winning the 1987 3200m. race and running a leg on the then national record in the Distance Medley Relay (9:56.3 still stands as the California record). 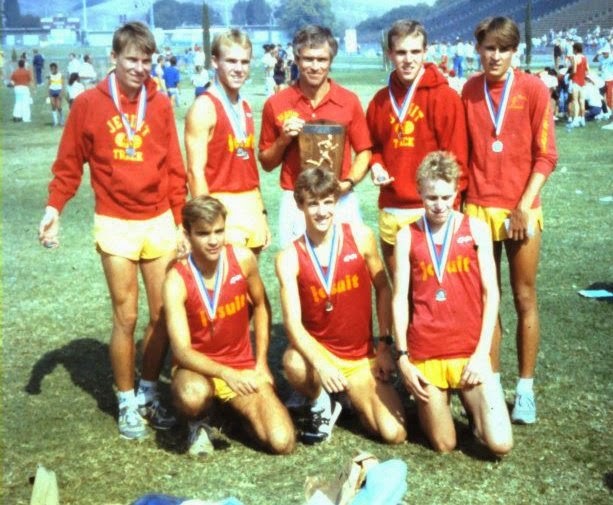 The Jesuit 1985 XC team with the Mastalir twins and with Thomas as the 3rd man still holds the Crystal Springs course team record at 76:15.4. You can check out that list here. Thomas went on to compete at the University of Arkansas for legendary coach, John McDonnell. Thomas still gets his competition on by cycling and is just as successful in that sport. 1) How did you get your start in running? Aside from XC and TF, what other sports did you play before and during high school? I started running at the age of 10. I was playing Pop Warner football, where my running talents were noticed by a parent as we ran laps before and after practice. I was a sub par player, but ran circles around everyone on the laps. Thankfully that parent was there to realize my lack of ability on the field and potential on the track. I ran a 4:35 1500m a few months later at the age of 11. A year later, I ran 33:52 for a 10k. I was now 100% free of splinters from my bench time in team sports which require hand eye coordination. 2) Looking back at your high school experience in both sports, what were your personal and team highlights? To this day, I have great results when I am brand new at something. My first race as a 114lb freshman was at the Clovis Invite on the famed State Meet course at Woodward Park in the Varsity race. I ran 15:08 for the 3 mile course, finishing second behind a senior from Mt. Whitney HS. The premature success probably limited me in some ways. I really did not like the pressure or responsibility to be the top runner, especially with the huge respect I had for the upper class-men on the team, not to mention the Mastalirs in the class ahead of me. I only ran a few track races my freshman year. The summer following my freshman year, on a whim ran a 10k in William Land Park where I posted a 32:01 10k with a blazing 5:45 for the last 1.2 miles. 8:58.8 3200m. finishing right behind Marc Davis and Todd Williams. Arcadia was a few weeks later, where I ran 8:53 with another fast closing 800m., besting Marc Davis for the win. As far as team results that created happiness, there were many! Coming to Jesuit in the era which I did, I was a kid in a candy shop. I still scratch my head thinking what a fantastic opportunity we all took part in. It was not until a bunch of years had gone by where I realized what a dynasty we helped create. As a freshman, we took a very young team to the Mt. SAC XC Invitational. I had previously run on the famed Mt. SAC course in an age group (Junior Olympic) XC race and loved the course. We won the Team Sweepstakes with 3 sophomores, 1 junior, 2 seniors and 1 freshman. We would come back 2 years later, setting the coveted team time record. That year, 1985, we had a phenomenal team. Our top 3 were unreal with a solid top 5, but lacking a 6 and 7. Had the top 5 all performed at 95% on that same day, they would have renamed the race to the "Jesuit Sweepstakes!". Track season of my Junior year was highlighted with a National Record in the DMR, where the Mastalir duo, Dan Cahill and I ran 9:53 at UC Davis. I will never forget the energy of the entire stadium. While all schools in attendance were competitors/rivals throughout the year, collectively, the stadium was behind the our record attempt. We took a 10 year standing record away from South Eugene, only to lose it the following year to The Woodlands, where my future Arkansas roommate (Eric Henry) anchored a 4:03. On the same UC Davis track, Eric, Mark and I swept the 3200m at the Section meet. There is nobody who was happier to get 3rd place in so many races than me. I loved it! 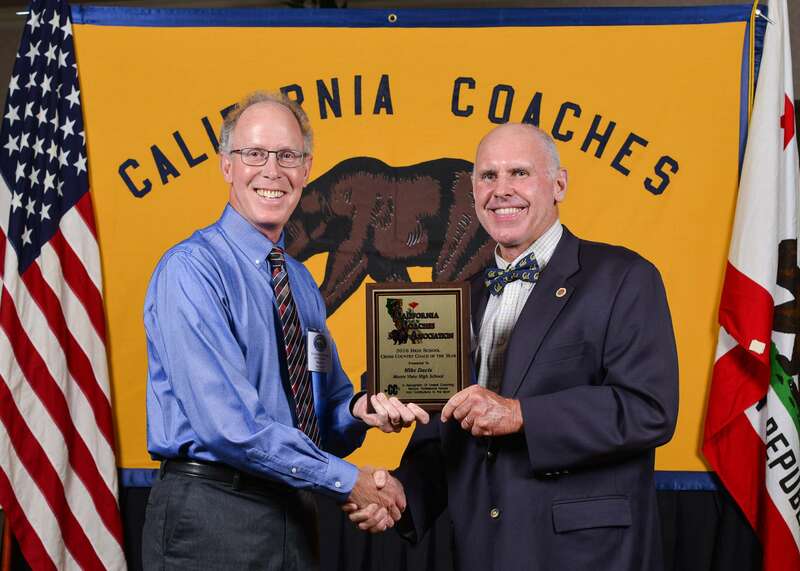 3) Tell us a little about your high school coach, Walt Lange and what was his biggest influence on you and your teammates? -"Jesuit All Time Bests" for each of the scheduled meets. He used to always tell us to Eat, Sleep and Run like a clock. It was not until years later that I realized he borrowed that quote from the great Jumbo Elliot. It was consistently being consistent that brought Lange so much success. There are only a few programs that rival Jesuit, but accomplished success by big numbers. York HS and The Woodlands ran huge miles. Lange had tried all of the above in his 13 years of coaching before I arrived. There are many ways to achieve results. His simple recipe was perfect for the masses. Not many injuries. It seems like we all had pretty good leg speed. Today I use this same wisdom: Apply sustainable efforts and success can be achieved for years to come. 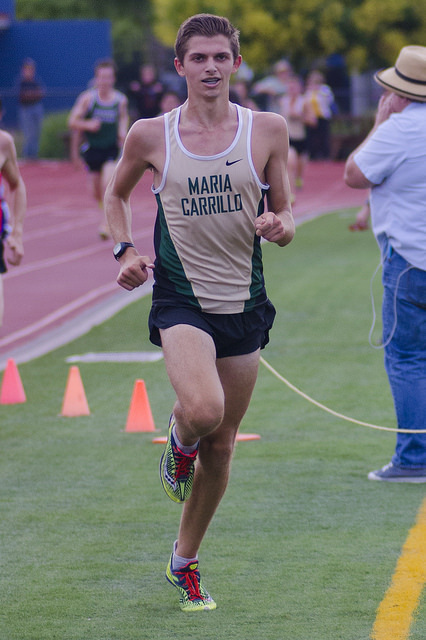 4) You finished in 2nd place at the CA state meet 1600m. as a senior. What do you remember about that race? I touched base on this above, a bit. Of course I don't dwell on it. However, if I could go back and make changes in one race, this would be it. I recall it being very easy. I think we went through 800m in 2:08. With 600m to go, the plan was to make it fast. I believe I ran 28 flat for that next half lap, followed up with a 30. A friend forwarded me the Youtube video a few years ago. Maybe I should have either waited til the end or not went so hard with 600m to go. Maybe I should have went harder?!? Did I say I don't dwell on it? Do you have the number for Uncle Rico from Napolean Dynamite? I need to someone to console me! 5) You attended the University of Arkansas. What led to your decision in choosing Arkansas? What other colleges were in the mix? It was odd that I ended up at University of Arkansas. They would have never contacted me, as Coach McDonnell would later ask, "Why would a kid from California want to come the Midwest...or South?" While I went to the best high school program in the US, I thought I might as well do the same for college. It seemed like the logical thing to do at the time. In hindsight, maybe I should have chosen to go to the school and state I did my 5th grade book report on: University of Oregon. I was a huge Salazar and Dellinger fan when I was 11 years old. What 5th grader trades heroes Tony Dorsett, Roger Staubach etc. in for Coe, Ovett and the Oregon program? The reason why Oregon could have been a better option is because of my mentor, Harold Kuphaldt. Harold was 5 years ahead of me, where he and I shared similar abilities and age group program, The Roseville Gazelles. I respected (and still do) so much, I would have been more likely to stay on track with the Walt Lange mantra of a clean and simple life. At Oregon, maybe I would have kept the nights short and the choices of beverages light. Oregon did not reach out to me until April of 87 where I had already signed a letter of intent with the Razorbacks. Just like the State 1600m......coulda shoulda! 6) You ran for legendary coach John McDonnell at Arkansas. What do you remember most about him and why do you feel he was so successful? John McDonnell was successful with same tools as Coach Lange. There were no secret workouts. Initially, he did not have the blue chippers coming to Arkansas. He built it from scratch. While he recruited from Ireland, his country, he was lucky to get the kids from the surrounding states. Even when I got there, the non foreign runners were from Missouri, Texas, Louisiana, etc. The late Dan Gabor and I were the first to come to Arkansas west of Kansas. His training regime was simple. Run 50-60 miles week during the summer. You ran with the team 7 days/week. If you did this with proper sleep and nutrition, you would do well. If you didn't, it was going to be tough. It was tough for me and others. John McDonnell was a motivator. He could have been one hell of a NFL coach. You would leave the team meetings wanting to conquer the world. Only if he scheduled the team meetings at 9pm on Friday and Saturday nights! Recruiting and stretching a scholarship is what really set him apart from all other coaches. He did not leave any meat on the bone, which was wise. My freshman year I was on a flu scholarship. He immediately made everyone an in-state student, lowering his cost per athlete. Most of us were from non-affluent families, therefore qualifying them for Pell Grants. By the end, I was not on a full scholarship, but never had to pay. However, it was baffling to see how many phenomenal athletes were on little aid. 7) What were your college highlights and proudest accomplishments? I was a rare case as a freshman, making the Varsity XC team. Although I made the traveling team, I should have red shirted and gathered my bearings. It was a huge transition for me: I can go on with all of the changes that led to a rough year and college career. It really came down to lack of sleep. I was an uncaged animal that was finally let out when I left to college. To this day, I am the last to leave a race venue or party. In college, I was the last to shut the door to my dorm. I never really had a huge season or moment in college. While I was on a handful of NCAA Championship teams, my individual efforts were never up to par. The greatest results were coming off a summer/winter break where I returned from Colorado where my parents where now living. I recorded the best result on the team in the VO2 Max test in August of 88. The problem was that it was August. The best actual race was the SWC Indoor Championships where Falcon, Reina and I crossed the line in the 3000m. Again, this was just off a winter break where I was back at the nest, eating, sleeping and running like a clock....just like that high school coach repeated! 8) At what point did you transition to cycling? What are the biggest similarities and differences between running and cycling? As far back as high school, I always felt sufficient/fast on a bike. The Mastalir's, my brother and I always talked about doing triathlons. If I looked back in my year books, each annual's note from the Mastalirs would reference doing triathlons together. Two wheels were always in my future but did not make the leap until summer of 1993. In high school I read the triathlon publications. The sport of biathlon (later turned duathlon) was pretty big; led by Kenny Souza. In 87 I thought maybe someday I would duke it out with this long haired, Bon Jovi look-alike. My entrance in duathlon was similar to my arrival at Jesuit. I won the US Pro Championships in April beating Souza, Tinley and the other names I used to read about. A few months later, I was 4th at the ITU World Champs in Tasmania, Australia, winning the World ITU Series at the same time. My entrance to Jesuit was a foreshadowing of my debut as a multi-sporter. The transition to cycling was pretty easy for me. I gave a feeble attempt to learn to swim. Swimming is much more of a technique based sport. If my last name was Mastalir, I probably would have won the Ironman a half a dozen times, as they were club swimmer growing up. Efficiency and technique are also required in cycling. At least your legs are somewhat trapped in a circle where you can't deviate much from a perfect linear plane. Most think that cyclists are big and bulky. At 6 feet in height, the average Tour rider weighs between 150 and 160lbs. On the world level, Chris Solinsky is an anomaly. 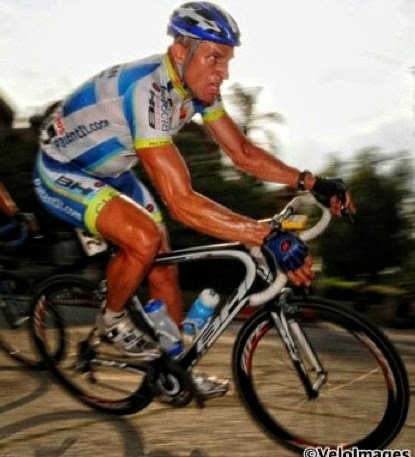 In reality, my morphology was much more compatible to being a cyclist. I did not turn to bike racing until the age of 40 when I returned to Tucson. My wife had went to law school a the U of A. After suffering from allergies, asthma and sinus surgeries over her 40 years, she recalled that Tucson was the place where she had great health. We moved here in 2008. After going full throttle at work and life for 10 years, Tucson provided a more balanced life than San Diego, for theboth of us. I started riding to get back to fitness. I reach back to the memory bank and really started to eat, sleep, exercise like a clock.....for the very first time in my life. Now that I was getting older, I decided I wanted to be healthy and fit for the long haul. Cycling has been awesome. The cycling community here in Tucson is the best. Having the the correct setting has made the athletic side of me sustainable. In the last 5 years, I have defied the rules of age. While I do not train or live like a pro, I have used some wisdom and given genetics to somehow perform at a national level, although I type here at age 45. Some would say, including me, that I left a lot of meat on the bone in my formidable years as an athlete. If I could hypothetically go back and do it right, with the caveat of being done at age 27 vs. doing it the way I have, I think I would take the same rocky road;being healthy and fit for a life time. 9) From your perspective as an experienced runner and cyclist, what would you say really worked for you training wise in high school and what do you wish you did differently? What worked for me in the good times is the same that works for anyone that performs at a high level. Live like the clock Lange once spoke about. Of course there are athletes who respond better to volume and some better to quality. It takes a bit of intuition to find what works best for you. It can take years to figure this out. If you have zero intuition, you may never know. To this day, Coach Lange or McDonnell could better tell you what worked for me than myself. An endurance athlete inevitably has to have a big aerobic system. In HS, I recall doing two 70 miles weeks each spring. These 14 days built a good foundation to race hard until the end of May. I recall doing lots and lots of strides. In my coaching of triathletes, strides are a key ingredient. They do not tap the anaerobic system and if done on these fancy turf infields, they are easy on the legs! 10) What is your advice for current high school runners with aspirations of competing in college and beyond? First of all, get a training log. I still like to use a handwritten log. I use a weekly planner. Later in life you get to look at these as story books. I have logs dating back to 1984. However, there was a block of years where I did not train much. When we were evacuated for the San Diego fires years ago, Noreen grabbed the cats. I grabbed my training logs! Keep a log! You can always go back and find out what was going on in your life when you were going good.....or even bad. Most importantly create your good luck by being placed in the hands of greatness! Somehow I landed in the hot beds of HS and college programs. Again in multi-sport, I landed in the hands of the best. Make opportunities come your way. Just like dating, the girl of your dreams will never come and knock on your door. Put yourself out there and great things will happen. Lastly, if your coach tells you to eat, sleep and run like a clock, do it! Endurance sports is a cumulative journey. Each years builds on the next. There aerobic system is much stronger than our legs. Your heart and lungs have no idea if you are running, rowing, cycling, swimming etc. I spoke to Jordan Hasay her freshman year in high school at the FL meet. When I asked her about her training, her data was 60 miles per week with 4 days of swimming 2miles (M-TH) I assume her 31 other competitors (yes, FL used to have 8 from each region) ran approx 30-40mi per week. Assuming 40, that is about 4.5 hours of training. Jordan had 7 hours of running plus her 4 hours of swimming. The other girls chasing the 14 year old through Balboa Park were only doing 39% of what little Jordan was doing. Your body can handle much more than you think. I just finished a 5 day Pro stage race (www.tourofthegila.com) at age 45 where I thought for sure I was going to have to DNF. Know your limitations, but do not be afraid of them. drive any of them. If his life got cluttered with complex living, his running would slow down. Have your basic necessities. Even too many pairs of running shoes can be bad. Live lean and maximize your potential with what you have. Recovery: This is something I should have written a 2000 word essay on. This is an around the clock process. Recovery never stops. When I am racing a 100mi stage, the calories I am consuming during the race is setting me up for tomorrow's stage. Never stop the recovery process. Sleep: Sleep a minimum of 8 hours every night . Structure your life where you go to bed no latter than 10pm. Even if you sleep 1am-9am, you have disturbed your internal clock. Sleep is the absolute most important element in getting fast. Hard workouts are 100% useless if you do not get sleep. Again, sleep supersedes everything and everything. the morning and mass amounts of vegetables in the evening. As soon as you are done training, have a bottle of liquid nutrition available. 100gm of carbs following training is a step in recovery. Body work: This is something that was unheard of when I was younger. Massage, self massage, epson salt baths, ice baths, compression boots. There are so many tools in speeding up recovery. If these are done religiously, you can then imagine going from a 4:20 miler to a 4:05 miler. Please continue to add meets that are missing from the list below. You can add them below or email me the date at albertjcaruna@gmail.com. 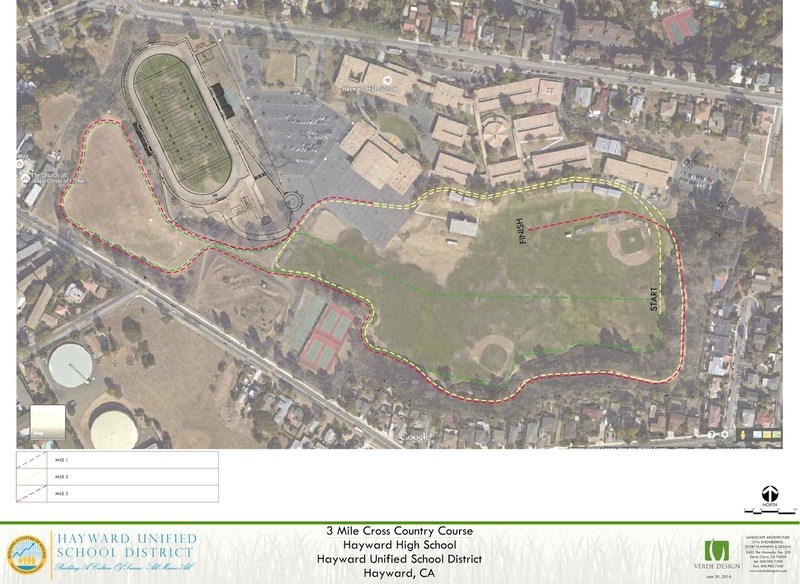 Due to construction at Hayward HS, the course for NCS will be slightly altered as you can see to the left. The image can also be found on the NCS website at this LINK. INDIANAPOLIS, IN (July 13, 2016) — Effective with the 2017 high school track and field season, a participant who assists an injured/ill competitor shall not be disqualified if an appropriate health-care professional is not available. · The removal of the Note in 4-3-1b(5), which contradicts the rule by limiting the placement of the American flag to one piece of uniform apparel. · Rule 4-6-5g, which states that it is an unfair act when a competitor receives physical aid from any other person during a race or trial, except as provided in Rules 4-6-5 and 9-7. · Rule 5-1-3, which notes that, in absence of a curb, if cones are used, they should just touch the inside of the line and be placed about 5 feet apart around the curve. · Rule 6-2-17, which clarifies how trials are recorded when a legal implement breaks during competition. · Rule 6-5-9e, which notes that if a shot put competitor touches the top or end of the stopboard before leaving the circle, it is a foul. 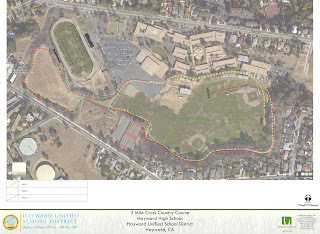 · Rule 9-1-3b for cross country states that the race course should include either directional flags and/or directional sign posts. · Rule 10-2-2, which notes that when multiple takeoff boards are used in the long jump and triple jump, the 20-meter distance shall be from the foul line farthest from the pit. The only changes from the 2015 season is that the Los Angeles Section gains one spot in Division III for both boys and girls.